Congratulations to Ruth who ran a very impressive PB of 30:57, knocking 1:05 off her previous best and Ian Robinson, who came close, missing his PB of 23:43 by just 3 seconds. 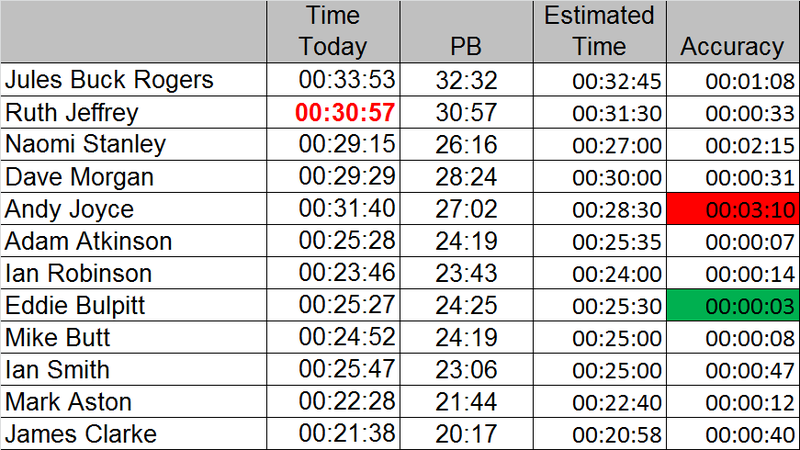 This was a ‘predicted time’ handicap and I was surprisingly impressed with the accuracy of the predictions/guesses, there were 9 people who achieved a time within 1 minute of their prediction and 5 who were within 15 seconds, the winner being Eddie, with a prediction of 25:30 and an actual time of 25:27 – hope he’s enjoying the chocolates. The most far out prediction was Andy Joyce, with a difference of 3:10 – but there are never any losers on the handicap, so he too has a small festive treat. The next event will be on 29th January. Until then, everyone have a happy Christmas and a great new year. Great event Matt, really enjoyed it today. Thanks for organising that Matt, thoroughly enjoyed it! The chocs are on my desk so feel free to dig in if you’re passing! Be quick mind, there are some right gannets around here! Myself included!